One decade of John Howard's Australia: ten cheers for John Howard? Thanks again to fabulous cartoonist Ron Tandberg and The Age. Let's give this one a subtitle: "Remember the white picket fences?" Ten cheers for John Howard? Australia's prime minister celebrates ten years of power, but is it a celebration for Australia? Are we 'just a meaner nation', or does this decade signify a slow encroachment of fascism for Australia? Here is the real story of the Howard years. We no longer live in a healthy, self-correcting democratic system, but in an expanding, albeit still "soft-authoritarian", system of corporate national power. While leading elites remain mostly quietly complicit, dissenters look on in horror as our national pride is devalued and our freedoms are dismantled. On this page two views from Canberra of the legacy of John Winston Howard - one from the 'mainstream' press, by former political editor Peter Charlton, and one by former diplomat Tony Kevin. HAS it been only 10 years? It seems the Howard Government - and, most certainly, it is a government dominated by the Prime Minister - has been in office much longer. The five years of Paul Keating, the eight years of Bob Hawke, seem ages away. John Howard's mastery of politics, and his undoubted ability to win elections, so apparent in the past decade, has been remarkably at odds with the cautious, tentative politician of the 1980s. Howard was then a loser. Now, he is a winner and, should he choose to remain in the job, will be a winner in the future. The 10th anniversary of his 1996 election win - better described as Keating's own goal - has attracted much comment, most of it laudatory. The Howard Government has given us a goods and service tax, an increasingly complicated taxation system and massive industrial relations changes, the impact of which is yet to be felt. It has also given us gun control, a certain positive. East Timor is no longer an Indonesian conquest but a new nation, but the role of the Howard Government in this process remains for the judgment of historians after the opening of the archives. Howard sees everything through a prism of domestic politics. His invitation to then president Habibie to hold elections in East Timor had much to do with the change in ALP policy on East Timor. What followed seems to be more accidental than deliberate. In any event, Howard received the kudos for the work done by the Interfet forces, and general Peter Cosgrove didn't do badly either. There has, however, been an ugly side to the Howard years. In October 2001, when Howard addressed the Liberal Party's election campaign audience in Sydney - a sleek, smug audience baying for protection - he uttered the watchwords for that campaign: "We will decide who comes to this country and the circumstances under which they come." On the surface, unremarkable enough. The reality was different. Women and children locked up behind barbed wire. Australian citizens locked up or deported. An Immigration Department hearing its master's voice and obeying with enthusiasm. And a total rejection of the egalitarianism values that greeted refugees in the 1950s. Before his election, Howard promised to "rejuvenate" the relationship with the United States. At the time, this claim was disregarded as just another piece of election campaign rhetoric. After all, Hawke and his defence minister Kim Beazley had been famously close to the Americans. Keating and Bill Clinton had a relationship founded on friendship and respect. What more could Howard do? At first, very little. He was uncomfortable with Clinton, no doubt finding both his politics and personal style distasteful. With George W. Bush, however, it was different. He found a soul mate. Both Bush and Britain's Tony Blair have come in for sustained criticism for sending troops into Iraq on a lie: that Saddam Hussein's regime had weapons of mass destruction. Howard has largely escaped similar criticism, possibly because our commitment was small and, mercifully, we have suffered no fatalities. 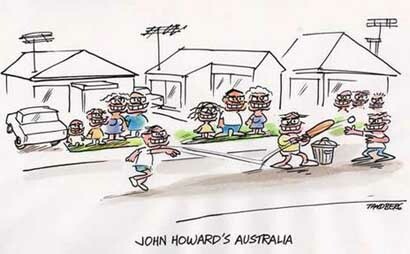 But the fact remains: Howard put Australians in harm's way for no good reason and on the basis of a lie. He has benefited politically, though. The 2004 election launch featured a series of much enlarged photographs of Howard posing for the camera with soldiers. He has farewelled, and welcomed home, every deployment: Timor, Afghanistan, Iraq, the Solomons, the aid missions in the wake of the tsunami. Howard's father and grandfather both fought in World War I. No doubt he thinks "meanly of himself" for not having worn a uniform since his days in the Air Training Corps at Canterbury Boys High. But this does not excuse his shameless exploitation of the armed forces for his own political purposes. Nor does it excuse the politicisation of senior levels of the armed forces, most notable during the "children overboard" affair in 2001. Indeed, the politicisation of the public service generally might yet be regarded as the most important legacy of the Howard years. When he came to office, he sacked six departmental heads immediately. For those who remained, and those who were appointed in place of the sacked six, the message was clear. Tell the Government what it wants to hear and don't tell the Government anything that might prove remotely embarrassing. From "children overboard" to the AWB saga, the pattern is the same. The Howard Government lives in a sustained state of plausible deniability. Keating used to complain that "the bar was set higher" for Labor governments. By that, he meant a higher standard was demanded. In a way, he was right. Howard's decision to live at Kirribilli House in Sydney, a splendid Gothic pile on the harbour, has attracted only mild criticism. Had Keating chosen to do the same, his decision would have been greeted with outrage. Equally, Howard's hugely expensive overseas jaunts have gone largely unnoticed, as has his decision to exclude the travelling press gallery from his aircraft. For the past decade, Howard has governed with one single precept in mind: what is best for John Howard and the Liberal Party. He has had a huge influence on the country by appealing to the lesser angels of our national character. As a result, Australia is a meaner, diminished nation. Peter Charlton, national affairs editor, was The Courier-Mail's political editor in Canberra when the Howard Government was elected in 1996. Howard has been highly successful in reading and responding to the electorate's mood, and in using prime ministerial power and leverage to implement programs that meet majority concerns. He is respected, not loved. Australia has become a meaner and more conformist society under his tenure, and these are hard times for liberal dissenters. But he has provided high levels of economic stability and national security. Legitimately, he has a democratic mandate within a still-healthy democratic system. I have a bleaker view of the Howard years. Only time will tell if my case is overstated. I see Howard as a disruptive and dangerous national leader. His rule is steadily degrading the values of our society and corrupting its political institutions. The longer he stays in power, the more the checks and balances of our society will crumble. We will continue our slow slide towards an Australian model of fascism. Power corrupts and absolute power corrupts absolutely. That is why checks and balances are crucial to the health of democratic systems. They are the grit in the gears of government machinery, preventing excessive concentration of power. Australian society used to be rich in such checks and balances. First, the political balance between executive, legislature and judiciary. Second, within the executive arm, a healthy Westminster system, dividing power between elected parliamentarians, and permanent professional civil, military and police services that were a-political guardians of national interests. Third, a true division of power between Commonwealth and States, with each enjoying real taxing and spending rights. Fourth, complex balances between the political sphere and civil society: the latter being a diverse range of academic, cultural, sporting, ethnic- or religious-based associations, cause-based and hobby-based groups, etc. Finally, local government councils occupied spaces between political and civil society, introducing more grit into the gears of governance. Looking at all these balances over the past ten years, one sees concentration towards federal executive power, that is increasingly centred around the Prime Minister's Office. The Commonwealth Government now routinely dubs itself "The Australian Government, Canberra". State and territory governments are thus being reduced to mere executing agencies. The Commonwealth through ever-expanding GST and other tax revenues now has huge financial leverage over policy areas that used to belong to states, local councils, or local communities. It can tell schools how to test students, what flags to fly, what "values" curriculum to teach. It can control what local roads are maintained, and even how well bushfire brigades are funded. It can determine priorities and values in national sport, and reshape solemn community observances like Anzac Day to convey whatever national cohesion messages it wishes. It presumes to enter, even set the terms of, national debate on every issue. With the loss of the Westminster system, officers of the public service, defence and police forces have all become more silently malleable to political will. There are still individuals of integrity in these systems, but the times now suit the yes-men and yes-women. The government routinely gets away with an unending series of abuses of proper process and accountability in areas of government fiscal probity, policing, defence and use of the ADF, border protection and counter-terrorism, because it now has all these bureaucracies firmly under political control. There is no permanency and no systemic protection for whistleblowers. Career advancement depends on uncritical responsiveness to government wishes. A similar analysis can be applied to the coalition parties themselves - parliamentarians who dissent do so at high career risk. The Howard system of governance is a dynamic, not static, organism, and can be analysed using biological or ecological models. It continues restlessly to probe for areas of weakness in all countervailing institutions, which it might exploit to expand its powers. As they weaken, it grows in strength. Thus, the loss of opposition Senate control is quickly leading to erosion of Senate investigative powers. Senator Heffernan's disgraceful attack on Justice Kirby, initially condoned by Howard, almost led to the loss of this key independent judge. And as the years pass, the power to fill retirement vacancies in any case moves the courts towards greater conformity with the political centre. Just as a free market system risks sliding into monopoly if one firm becomes too dominant, so a political system of checks and balances can thus gradually slide into a hegemonic system, if the will to expand power is there and if opportunities present. There is no doctrine of limits. Border protection and the War on Terror were providential opportunities to extend the centre's powers that Howard exploited to the hilt - and still does. In such an analysis, one must also look beyond formal areas of governance. The tentacles of Howard's army of unaccountable political minders and culture warriors now reach out into key institutions of civil society. Quietly networking in universities and think-tanks, distributing grants and consultancies, vetting promotions, this hidden army of persuaders is at work in strategic areas of civil society - mainstream media, the internet, academe. Dissenters are identified and their personal vulnerabilities filed, ready for coordinated targeted attacks when the time is right, with the aim of discrediting and marginalizing their voices. In this way, cultural pluralism is suppressed and social consensus around the political centre is strengthened. If these are culture wars, they are very unequal wars, fought between isolated, outnumbered and unfunded individual guerilla fighters, and a well-briefed well-funded army of Thought Police. Many dissenters retire hurt from the fray. Government resources are inexhaustible. Australian-ness is being re-defined in these Howard years, to mean assimilation to a conformist set of claimed "Australian" values. Democratic pluralism, a multiplicity of "values" and voices sharing the fruits of one liberal society, is no longer legitimate. The War on Terror has become the vehicle of a repressive climate of social and cultural conformism, more and more fascist in spirit even if its proponents do not yet acknowledge the similarities. Language has been perverted in true Orwellian style: mendacity is everywhere, a commonplace now. Howard's agenda-setting power as Prime Minister gave him the power over these 10 years to reshape the national agenda around his preferences and prejudices. Opposition leaders and mainstream media leaders perforce inhabit a world whose language and frame of reference Howard's rule has largely defined. Real dissenters in the opposition and media are ridiculed and pushed to the margin. A few illustrious names are left to work in place, as token demonstrations that the right to dissent still exists. Occasionally, public scandals flare up, like the Rau-Solon migration abuses and AWB now. But many issues of gross misgovernance - e.g. SIEV X in 2001, the demonstrated proven DFAT negligence towards Australian holidaymakers' safety in Bali in 2002, and the illegal secret ADF invasion of Iraq in 18-20 March 2003 - are simply ignored by mainstream politics and media. They are too dangerous to tackle now. Based on such an analysis of the Howard decade, we seem on a downward slide towards an Australian fascism. So is this man a political super-hero? An über-leader? No, and here the fascist model helps us to understand. Fascist structures sometimes allow quite mediocre people to accumulate large powers, because they concentrate groups of people who enjoy living in or close to systems of raw power, and the corporate and support resources such staffs can call upon. Howard Inc. is now a lot larger than John Howard as a man. It is a powerful corporate entity and needs to be analysed as such. (A good place to start is the Australian Financial Review 2005 'Power' magazine supplement, offering a rare insight into how the Prime Minister's office works). Another useful way of looking at the Howard years is as a failure of nerve by Australia's managing elites. Many thousands of politicians, officials in various agencies, business leaders and civil society leaders, have periodically failed at crucial moments of choice during the past 10 years to exercise their powers and responsibilities in what used to be a pluralist system of checks and balances (e.g. children overboard, SIEV X, Iraq War, AWB now) to denounce or to simply say 'No' to the latest demands of Howard Inc. With each such successive failure, Howard Inc. grows in power and ambition. To me, this history of the past decade is not about a more passive, selfish society that by democratic majority vote has accepted what is being done to our country as the necessary price for our economic and political security. To me, it is much more about a betrayal of values by our elites, who should know better, and the conning of our people. Some of us, thankfully, are still fighting.